Does it also say you need to pass Spring 18 in your maintenance status email? I have an object Policy that has an expiry date and status as fields. I want that when the policy expires the status should be updated as Expired. How can I do that? I have built a process but it only updates when the record is edited. How can I update the existing records? You don't actually need a Process. I would go for a Process ONLY when it's really required like say you want to update multiple child records, may be a parent record(via Lookup), creating records in another object or say submitting for approval. Simple uses cases such as updating a field on the same object or may be a time-based action(for example an Email Alert/Field Update or so), my go to option will ABSOLUTELY be Workflow Rules(I still love them you know!). In this case what you need is a Workflow Rule + Time-Triggered Field Update. Setup a Time-Trigger that says "1 Day after the Expiry Date" and then add a Field Update to it. I configured a flow to query a set of line items, iterate thru them and get the highest line item in each category. Each line item is associated with a category. I found similar issues to this error message and they reference it could be a heap limit issue, but I am getting this error with collections as small as 1 record. In some cases works no problem, in some I get the same error, always in the same step. I made sure the variables being compared in the step are of the same type. In the decision element where the flow was breaking sometimes, I was doing a comparison of a variable defined in the flow as currency against a currency field from a SObject. For some reason, this was causing the cast issue (even though both variables were of the same type - currency). I ended up creating a formula field (Type: Number) in the object to store the currency value. That worked and the flow has not broken since. Lighting Experience - I have the System Administrator profile, but do not see the plus sign to switch. How do I enable myself to switch from Classic? From the lightning, click on the your name or the circle in the image then you will see a pop up message with some option. There please click on switch to salesforce classic then you will be routed to classic version. Chedk this video at the end othe video he will be changing the lightning view to classic view. Was looking for the Lighning Object Creator (https://www.salesforce.com/blog/2018/09/lightning-object-creator-spreadsheets-into-apps.html) yet can't seem to find it anywhere? Can someone help point me to where it is available? 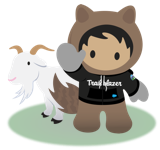 If you are interested in joining the pilot program for the Lightning Object Creator, reach out to your Salesforce AE or Salesforce SE and give them a business case for it. If they think it will be applicable to your business, they will put you in a pilot and set you up with what you're looking for. You will need to integrate your Odessa system with Salesforce using REST or SOAP API. Post this question in developer forum "developer.salesforce.com" to get more details around the integration. let me know in case you need further details. I have created a custom field called "First Responder Date Time" under "Case" object. I am writing a workflow rule to update this field if this is blank first time so I cna track when was the response first provided to case tickets. When I create my rule, I select "Field Update" after adding all the information (I think the evaluation criteria will be - created and edited). After selecting "Case" object under field udpate, I am trying to find the first response field I created but it doesn't show up in the drop down. I see there are standard and custom fields but my field is not visible there. Why is it so? How do i add it the the Field update picklist? The field is a Date/Time field. My company only uses the Salesforce Service Cloud. Even then, we do not use communities and very limited chatter. I have taken both ADM 201 & ADM 211 classroom course. I passed the Administrator Certification exam last year and would like to pass the Advanced Admin Cert this year. I already have 1 failed attempt; studied for almost 2 months using my Trailhead account and searching free websites that covered topics in the study guide. Obviously it wasn't enough. Are there any reputable online paid courses (I am not looking for dumps as I really want to learn and understand SF at an advanced level), or does anybody have premeir support that I could pay to access? http://focusonforce.com/courses/salesforce-certified-administrator-study-guide/ is tremendously helpful resource. I highly recommend it. What is the difference between lightning app and connected app? Lightning App - Are the collection of Tabs(Objects, Lightning Components) that works together to achieve our functionality. For Example - Service, Sales, Service Console, and etc. And one more thing these apps will not be availbale into Salesforce Classic. Connected Apps: - Connected Apps are used to Authenticate our salesforce while consuming Salesforce API (no matter SOAP or REST) then we go for Connected Apps which provides Client Secret and Client Key that we use in the request. These two keys are responsible to know which salesforce org we are going to take access. Example: - If you are using Facebook then you may have used the app like "know your marriage Prediction" these all asking for facebook permission they use connected Apps but of Facebook. I have two custom objects which are Shopping Cart Items and Payments. The Shopping Cart Items have a lookup to Payments. So what I want to do is have a list of all of the Shopping Cart Items related to the Payment in a text field on the Payment using the Name field in Shopping Cart Item. I can't seem to figure out how the loop should be set up. Any help? I have used an example of Accounts and Contacts.